Built with Simplicity in Mind! CWC has been built with simplicity in mind. Once logged in, a Therapist can be performing a client consultation within 5 simple steps. 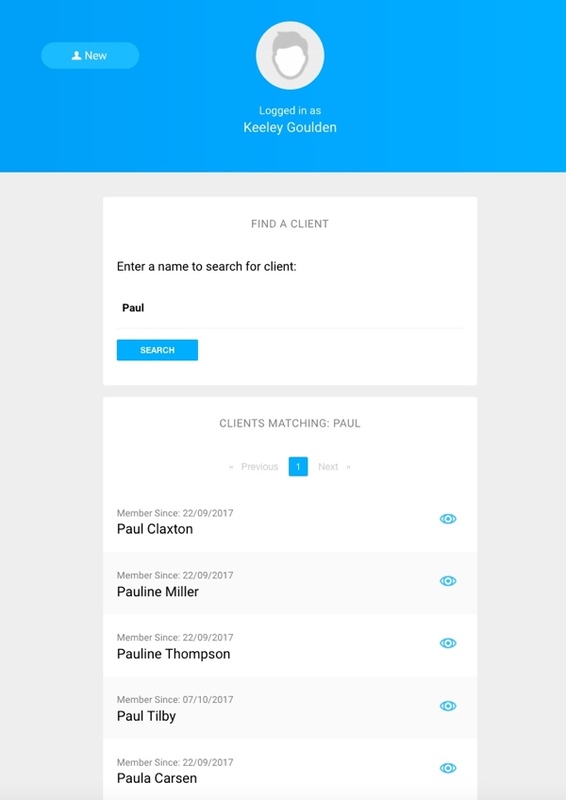 The process from signing up, to completing, viewing and adding notes or images to consultations has been built with simplicity in mind. 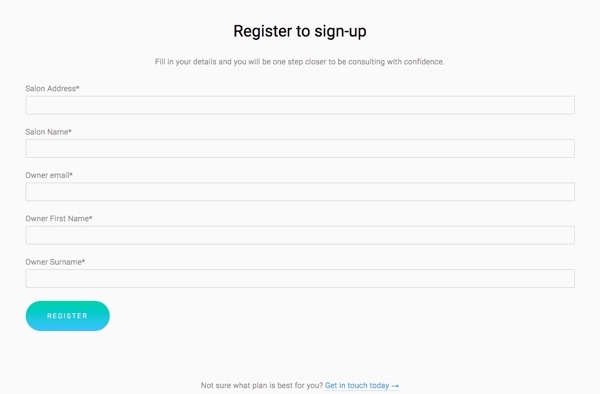 Complete the registration form on this website, this will generate an automated email asking you to verify your account. Click on that link when the email comes through, make sure you check your junk/spam folder in case it ends up in there. 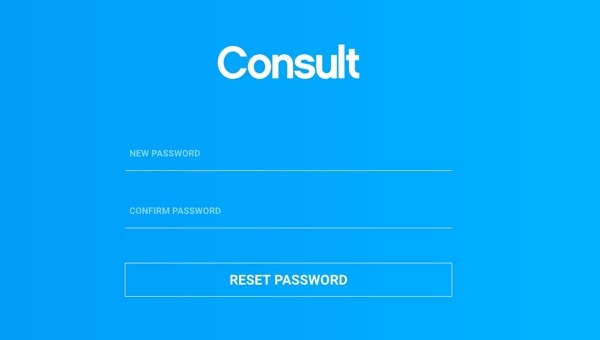 Enter a password in the New Password and Confirm Password boxes then click Reset Password. Your account will now be verified and you will just need to click on the link to login to your account. Choose which subscription suits your needs in respect of how many Therapists you will have using the system and enter your credit/debit card details. If you are a single Therapist you are now all ready to go, if you are a salon you simply add your Therapists to the system. Click on the menu tab in the top left hand corner, click on All Therapists, then Click on New. 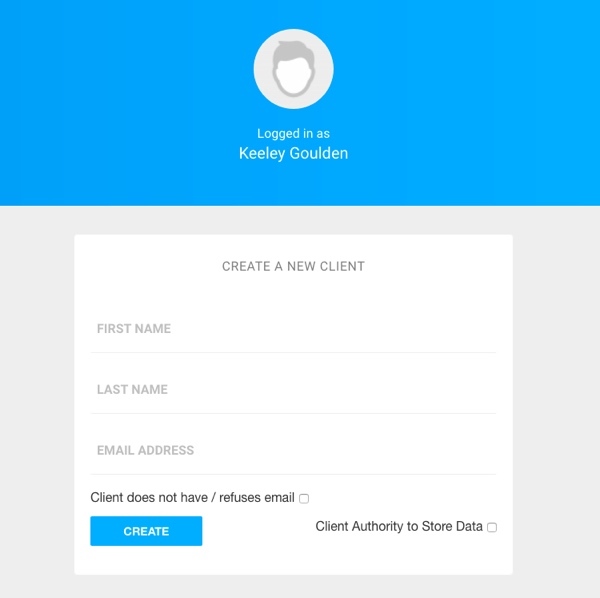 Once you have created your Therapists, they will receive an email to verify their accounts, once this is done they will have there own separate account logins and will all be now able to carry out consultations. Go to Settings and choose which consultation forms relate to the treatments you carry out. 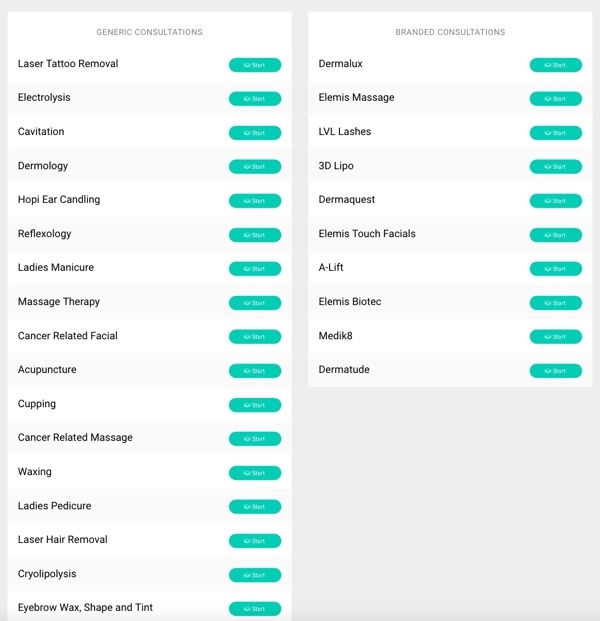 There is a list of generic treatments, just click on the ones that apply to you and then click on save. 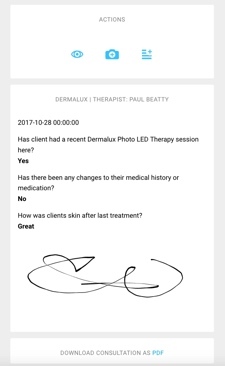 You can also add branded consultation forms by selecting the type of treatment and entering the treatment name. This will generate the correct form for you to use, again tick that form and click on save to add it to your list of treatment forms. You can deselect any treatment at any point should you stop doing that particular treatment. You can now start consultations. 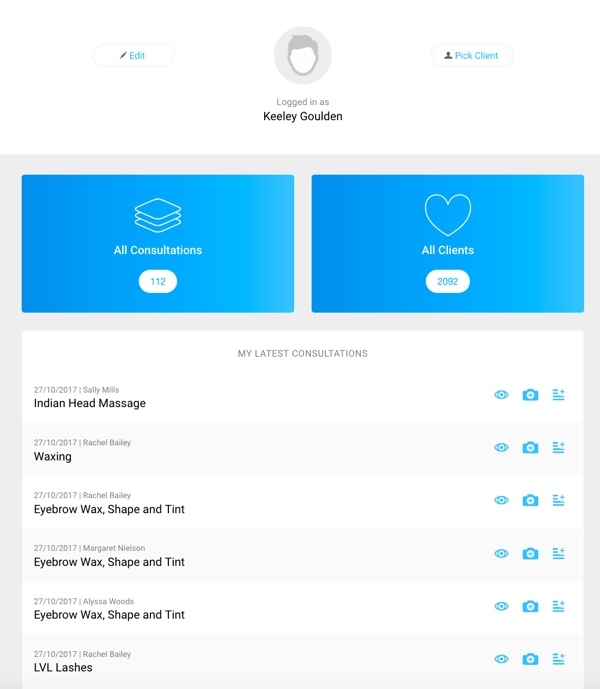 Once a Therapist is logged into their account they will see their dashboard showing their latest consultations and all the salon clients, the therapist simply clicks on pick client, search for client by first name, click on the eye symbol to select the client or enter New if client does not yet exist in the system. Now simply choose the consultation form required for the treatment. Carry out the consultation form following any instructions on contra-indications or possible issues. The client signs the form and it is then submitted and stored within the system. Notes and images can be added at any point. 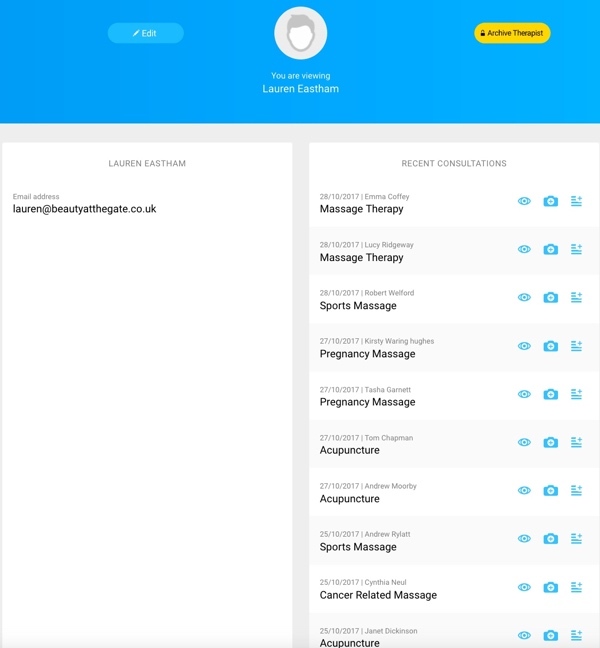 There are may other features that as a salon owner you can access such as individual Therapists accounts, your own salon dashboard showing all your Therapists, clients and consultations carried out. 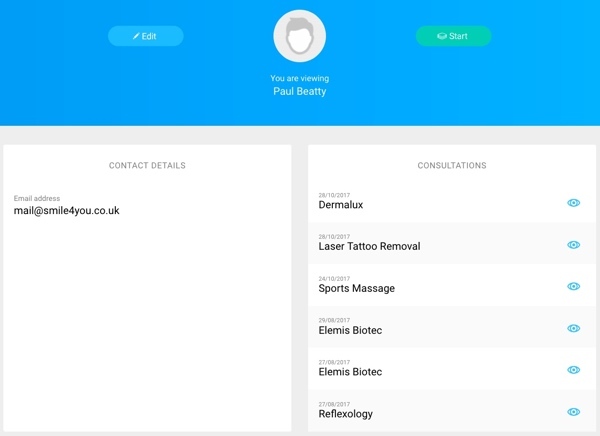 The system will also email your main email address copies of the aftercare emails sent to your clients so that you know full consultations are being carried out.